Hey hey hey! I’m Annabelle. 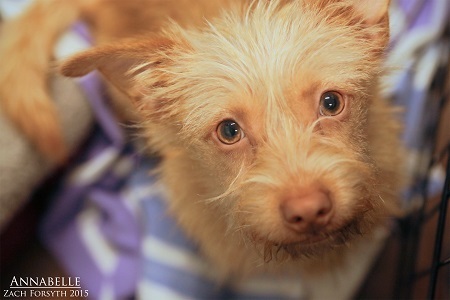 Your neighborhood 4 month old terrier mix with a scruffy coat and a big personality! I’ve got the confidence to take on the world, and can make friends with anybody! I’m smart too, I can’t wait to take obedience classes (which are mandatory with my adoption) so I can learn all the cool tricks and become a YouTube sensation. I know I’ll get a whole lot of likes because I’m a lovable girl! I get a long with other animals and all people, it’s just important to know that since I am a puppy I will require a bit more of your focus and training! Ready to meet this affectionate, squishable, playful pup and become internet famous? Fill out the adoption application so we can schedule a meet and greet. I am fixed, vaccinated and microchipped. My adoption fee is $300.